We are expecting a baby soon. How is our German Shepherd going to be with our new baby? I have heard both good and bad things about this situation. What can we do to prepare him for this? wonderful with kids and one of my girls was the nest babysitter ever - she was so patient with the little ones and loved to keep them clean - often to their mothers disgust but this does not happen in all situations. This is a very important step in having children and pets and can be handled but planning needs to be done to make it go as swiftly and carefully as possible. There is an article on this site already about just this question in particular with several ideas and tips on things to do to make the introductions as easy as possible. What kind of tempermant does your GSD have? If he/she is prone to be nervous or a fear-biter or doesn't tend to like noise or little kids I would say take extreme caution in letting her around you baby. Of course he/she can be trained to behave well around the baby and as long as the baby doesn't do anything drastic your dog will be fine. A even tempered, lovable, and serious GSD might think the baby a bit odd at first but GSD's are adaptable and after awhile he/she would grow use to the baby. Whatever your dogs tempermant you must always supervise them around dogs especially large ones. You never know when even the best behaved dogs might be pushed to far by a little child. 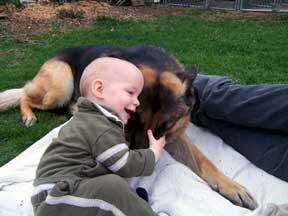 My first german shepherd was 6 months old when I brought home my fourth son. My husband was a wreck and believed that Rommel, our GSD, would kill our son. Rommel is now 5 years old and our son 4...we have never had an issue. Additionally, we added another GSD to our household when the same son was 2. A female we named Evy. I was a bit more tentative about having a female - I heard that they are VERY protective and aggressive. Evy took to my son(s) and Rommel like a bee to honey. I have never seen either of my dogs behave aggressively towards my children. If anything you now have an incredibly loyal and protective friend for your child.